My nineteenth stadium of 2014 was on Saturday 13th September. 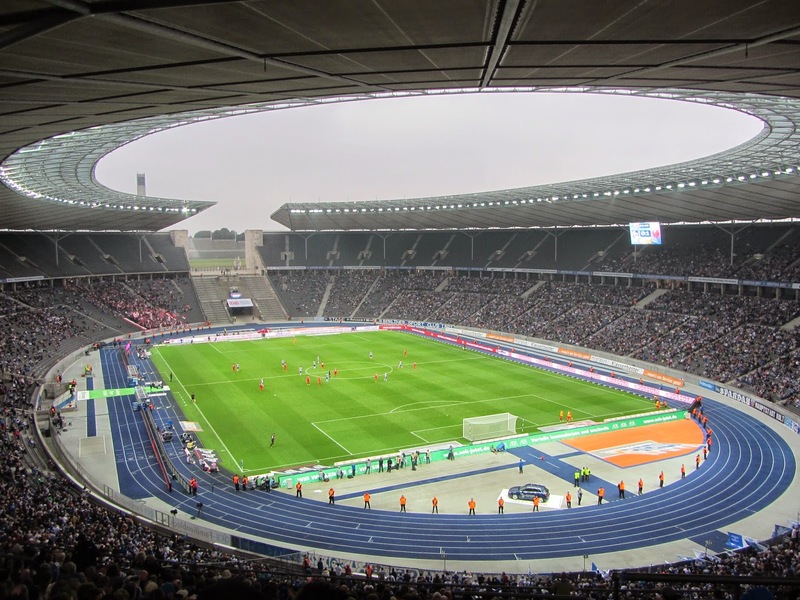 The match was Hertha Berlin vs. Mainz in the German Bundesliga. 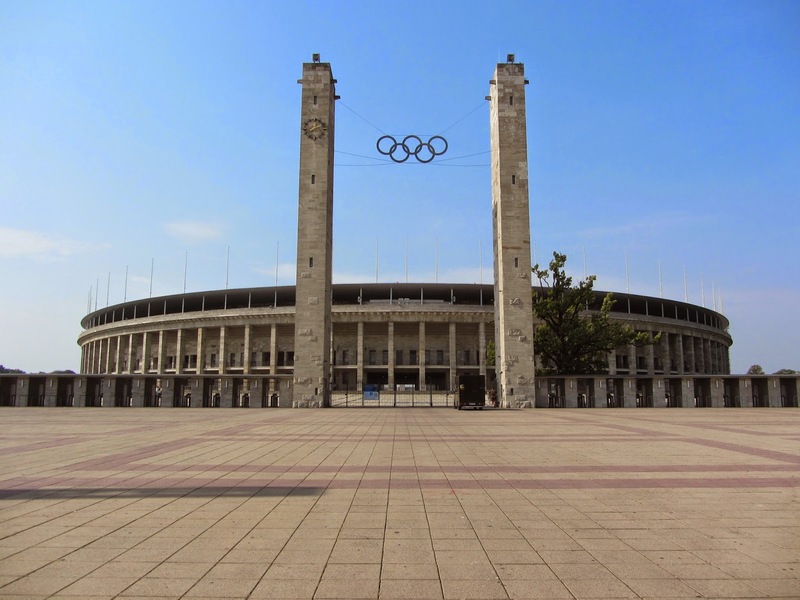 The stadium is part of the Berlin Olympic Park which was created for the 1936 Olympic Games. The complex is located in the western part of the city and is served by both an S-Bahn station and and U-Bahn station though there are also several other stations within walking distance. The venue has been home to the club since 1963 when they left their former home in the north of the city. The stadium underwent substantial renovation works between 2000 and 2004 to bring it up to the required standard to host the 2006 World Cup Final. Though many facilities were vastly improved the main look of the venue was retained. There is still the gap on the western side of the ground where the steps run up towards the Olympic torch and the stone list of medallists from the 1936 Games. This also allows views of the 250ft high bell tower which was built in 1934. 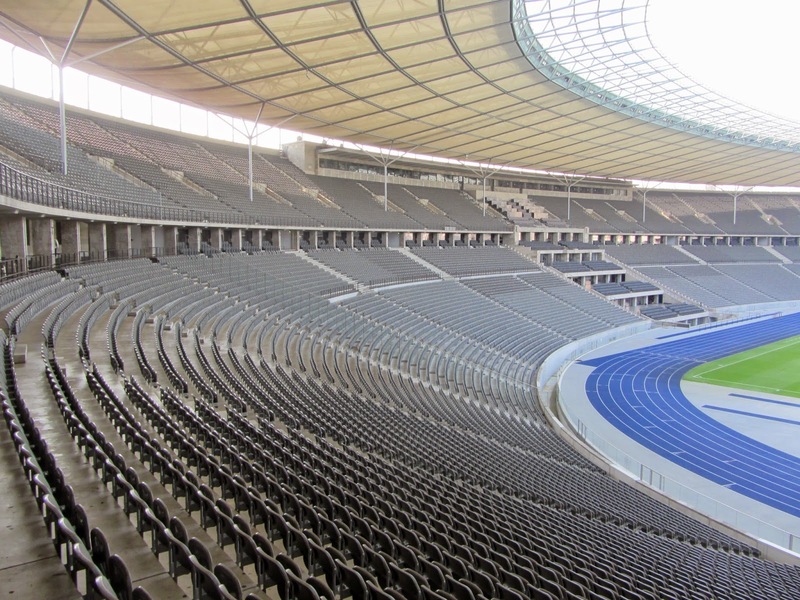 With a capacity of 74,244 the seating takes the shape of a two-tier bowl though there is a section in the middle of the south side which is styled differently. The area facing the pitch consists of four small rows of VIP seating on the lower tier, a media centre on the top tier and corporate boxes right at the back of the stand. As part of the renovation works the south side now has an extensive five storey area housing VIP lounges, kitchen, police holding area, player dressing rooms, a chapel and a large car park. When the players walk onto the pitch they emerge from a tunnel underneath this part of the ground. The substantial roof weighs approximately 3,500 tonnes and has twenty supporting columns distributed across the top tier to hold it in place. There are spacious concourses outside of the arena on both tiers with a club shop built into the eastern side of the lower tier. As the stadium is just a part of the wider Olympic Park there are vast grass areas outside for many food and drink outlets on matchday. In addition to the main stadium there are smaller football and athletics venues as well as a hockey stadium and outdoor swimming stadium. To the west of the ground is the Maifeld with the clock tower at the top of this. When approaching the main entrance to the park on the eastern front fans walk down the wide Olympischer Platz with the Olympic rings displayed between the two that dominate the skyline. The first half was a lacklustre affair with neither side looking particularly likely to score until the 36th minute when the visitors got their noses in front. The Hertha defence were slow to react to a looped ball into the box allowing Koo Ja-Cheol a clear run at goal. His initial shot was saved but he then squared it for Shinji Okazaki who rifled the ball into the corner of the net. The second half was a more entertaining one for the fans as the effort of the home side increased. They threw on new signing Solomon Kalou with 20 minutes to go but just seconds after this change they found themselves 2-0 down after a slick team move by Mainz culminated in Sami Allagui (playing against his parent club as part of his loan spell at Mainz) tapping in from a couple of yards out. In the 86th minute the hosts reduced the deficit when Ronny scored from the penalty spot but any hopes of an equaliser were dashed in added time when Hertha were undone by another ball over the top as Yunus Malli found enough space to cross the ball to Okazaki who stroked in his second of the game from close range. Mainz were well drilled and able to expose Hertha's poor defence with the same tactics on several occasions - a well deserved victory for the away side.